CATCH Power is a start-up Australian Company that is developing intelligent hot water diversion systems to channel surplus solar energy into heating hot water. 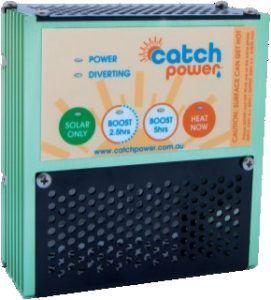 Australian designed, engineered, and manufactured, CATCH units will work with any solar PV system and resistive element (electric) hot-water or heating system. Any surplus energy from your solar PV system will be diverted to your hot water tank to heat water. If there is a shortfall of energy required to heat your water sufficiently, CATCH will source the remaining power from your regular hot-water Tariff. This will allow you to maximise your solar self-consumption, reduce overall household electricity usage, further reduce your carbon print, and save you money. CATCH hot water diversion systems come with a standard 2-year Warranty that can be extended up to 5 years by registering online. Green CATCH is the basic diverter model of these clever hot water diversion systems. It has been specifically designed for those without internet connection. Green CATCH is installed in your Meter box. It utilises a user-adjustable dial to determine how much off-peak/ Tariff 41 power to use to start the heating process. If required, Green CATCH is able to override the setting on the dial if required to ensure a continuous supply of hot water. Blue CATCH is comprised of two parts – the Diverter, and the Communicator. The Diverter is installed in your meter box, and manages diversion of excess solar energy into your hot water system. The Communicator is installed next to your internet router and provides weather information from the internet to the Diverter. It also provides monitoring of both the unit and solar system to ensure everything is working as it should. Blue CATCH requires continuous internet connection, and uses 19kB of data per day. The system can be either manually or remotely adjusted at any time. 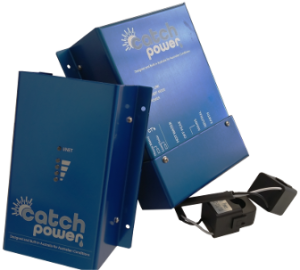 For further information see the Catch Power website.